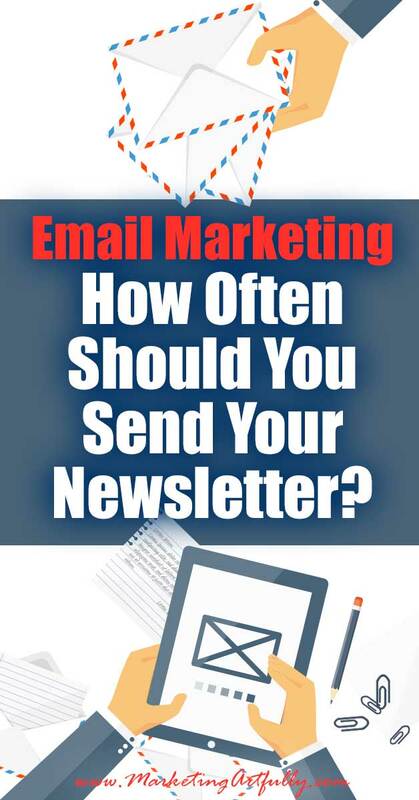 Email Marketing - How Often Should You Send Your Newsletter? You are here: Home / email newsletters / Email Marketing – How Often Should You Send Your Newsletter? 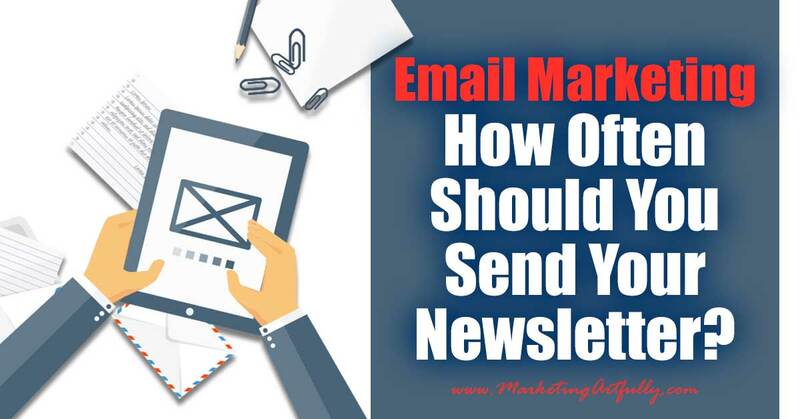 Email Marketing – How Often Should You Send Your Newsletter? Email marketing is much less effective then it once was. I hate to say that, but it is true! Think about your inbox…when email first came out you got that message that “you’ve got mail” and bam, you were ready to open it right away. Well I can tell you I do that with some emails. A few that come to mind are Geoffrey Gitomer’s Sales Caffeine and Chuck Green’s Ideabook. So why do I like these so much more than the rest of the “stuff” that I get in my inbox? Gitomer’s comes out once a week and I tend to read about half of them, depending on how crazy busy my day is when they show up. Chuck’s comes once a month and I KNOW I have to budget a couple of hours to go through all of the information that he packs into them. Another fellow sends almost daily messages BUT he has writers on staff who scour the web for useful information and I generally find great tidbits in them, I read about 1 in 7 of these. If you don’t send them every day, your list will forget you! So does this mean you should send a weekly newsletter? Um, maybe! 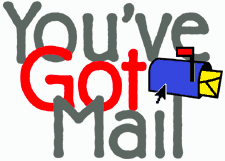 Do you have relevant, AMAZING information to send to your list on a weekly basis? Do you have time to prepare great stuff? Is sending your newsletter stressful or fun. Do you have a plan for why you are sending so many emails? Can you sell to your list or will they get fatigued and unsubscribe? I was super excited to find a great article from Get Response about Email Marketing Statistics (April 2018) that complimented the information that I had from 2017 and 2012 when I originally wrote this post! This seems to show that the open rates (how many people receive the message and actually opened it) has actually gone up a bit in recent years. Now, there are some REALLY big mitigating factors to this number as some email readers show as an open even if it just popped up in the preview screen before hitting the delete button. It also shows that click through rates (clicking on something in the newsletter and going to an outside link are declining pretty drastically. In the not so good news department, unsubscribe rates are rising. This could be because people are more particular than ever in what they spend their time. This requires that we do an ever better job of providing good, quality content that will help their lives. Email Marketing From The Trenches! If you are a internet marketer, networker, event promoter, daily deal site, etc. you can send a message out anytime you have something interesting to send. Your list is going to know that this is the kind of thing they signed up for and, though you might have a higher than average unsubscribe rate, you will get results! If you are a prolific writer and enjoy sending out great content (NOT SALES MESSAGES) every week, you could probably get away with it. I have noticed that the ones who send weekly GREAT emails tend to have a staff. If you are the normal small biz owner who is on my list, you can fudge a weekly newsletter pretty easily by sending out a synopsis of your blog posts to your list. For example, I publish 3 blog posts a week so I could send out a newsletter with a paragraph about the article and then a link to my website to finish reading it. This is a nice way to re-use your content and get people from email to your website. A monthly newsletter seems to be the most appreciated kind. It keeps you in the mind of your clients or list and is not onerously hard for most small biz owners to produce. So what got me to thinking about email marketing and how often you should send your newsletter? Somehow I got on a list for a lady in the next town over. I noticed she sent 2 marketing emails to me Monday and went to unsubscribe from her list but saw that she had the option to pick only Colorado related information and I though, GREAT! Maybe I was just getting everything and I would now get relevant information. Sigh… The next day, two or three more emails and I had to opt out entirely. Seriously, I get THOUSANDS of emails a day and even if she is selling gold bricks for a dollar, I do not have time to read 3 marketing messages a day! So what are my numbers? After I got done writing this, I thought it would be fun to take a look at my last mailing and see what my numbers looked like! SOOOOO… I KNOW that by working on relevancy I have increased the open rates and interactions for my email subscribers. One of the main ways that I have done this is by religiously segregating my content and email subscribers list. Previous Post: « Facebook Commenting – EXACTLY What To Say or Do! But how many people do follow the rules or suggestion? I think if the newsletter sender read the post they will get more sales if they want to sell something or if they want to share something it will too. But first of all we have to think user/visitor perspective. We shouldn’t play with our visitor’s valuable time.